Deputy Foreign Minister of Azerbaijan, rector of the Azerbaijan Diplomatic Academy (ADA), Ambassador Hafiz Pashayev has been awarded Commander's Cross of the Order of Merit of the Republic of Hungary. 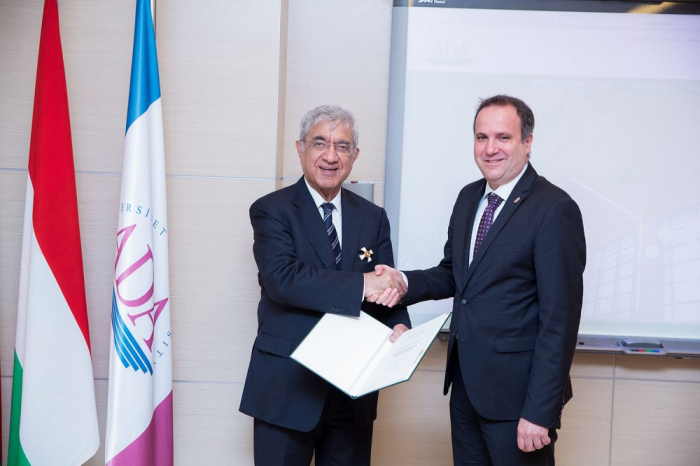 The Hungarian Ambassador to Azerbaijan Viktor Szederkenyi presented the award to Hafiz Pashayev at the ceremony held at the ADA University. Ambassador Viktor Szederkenyi congratulated Hafiz Pashayev on behalf of the Hungarian President Janos Ader. He emphasized that Hafiz Pasahayev was awarded the Order in recognition of his contribution to elevating the Hungary-Azerbaijan cooperation to a strategic level and strengthening cultural and scientific relations between the two countries. Hafiz Pashayev thanked the Hungarian Ambassador for the award, and underlined that he will do his utmost to bring the two countries scientific communities much closer to each other.